Computers are used for many purposes, and more of your information and data is stored on your Mac only. However, if you still haven’t thought of protecting your Mac from various malware attacks, then your essential data is in real danger. In case you have decided to buy antivirus for your Mac then we have collected best antivirus for macOS Mojave 2018. There are a lot of antiviruses, anti-malware, anti-spyware and such things are available, but the question is, are they worthy? The answer is no because they can block your system, eliminate the data and harm your MacBook Air in many ways. So we would suggest you take a look at the list we’ve made and chosen one. Bitdefender antivirus is impressive according to its performance as well as the interface. In seconds you will get scanning results of the entire Mac without affecting the CPU of the system. The most popular malware which is used by hackers to seize your data right from your laptop is ransomware. But there is no need to worry if your MacBook has Bitdefender established and protect every single bit with multi-layer security. Time machine backups are safe within your PC and along with this software can easily handle adware. Get rid of add-on install and defective toolbars which get downloaded automatically on your device. It will cost you $29.99 for one Mac, and when you buy for more Macs, then the price will be affordable. If you are looking for an antivirus which can remove malware in real time, then Malwarebytes is right for your macOS Mojave. Malwarebytes anti-malware software is made up of superior technology which takes instant action against virus and malware. This antivirus is suitable to the new update of Mac that is macOS Mojave, neither it will degrade the performance of the Mac not it will occupy much storage. There are two versions available one is free which contains limited functions and other is premium version. If you are interested in protecting your MacBook Pro then go for the premium version, it will cost you $39.99 (Annual Subscription). I bet you have already heard this name before and some of you have used Norton Security in your Mac. Asides from what standard antivirus offers it also provides alerts when you try to download and install the corrupted apps. It will also help you to clean the hard drive of Mac by removing corrupted downloads, junk files, suspicious content and more. A wide range of functions and options are available so that you can choose the necessary features and mainly you can afford. There are many options available like automatic backups, cloud storage, an online portal for managing other devices and more. An annual subscription will cost you $29.99. 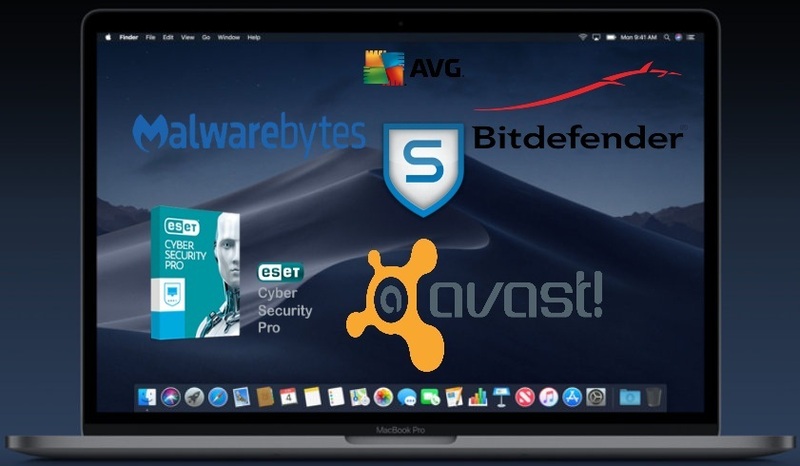 Avast security leads in the category of best free antivirus for macOS Mojave. All the basic features like home network scans, scheduled scans, antivirus and protection of web, files and more. But if you prefer to buy paid version then additional benefits such as Wi-Fi inspector, ransomware shield, real-time protection against viruses, spyware, and Trojans. Browse on web safely, protect Email attachments, and other threats are prevented from Mac. Even it will block downloading the contents from the unsafe website. You have to pay $49.99 for the paid version of Avast Security. Protect your external hard drive along with internal hard drive with Eset Cyber Security. All in one security software is suitable for Mac’s health and dominant execution. You can play the game, watch movies, browse web pages, and download files safely while Eset Cyber Security will protect your macOS Mojave. Like others, it will also cost you $29.99, but it consists of unique features like anti-phishing, cloud-powering scanning, automatic updates, Anti-theft, personal firewall, and parental control. If you are not sure about this antivirus, then you can try the trial version for 30-days and then decide to buy or not? AVG has been performed very well in past years. The desktop version has an attractive interface and provides reliable protection to your entire Mac. The basic version is recommended for routine use but if you are hard user and all-time inserting external drives or downloading files from the web then paid version will secure your Mac. Besides, if you buy a subscription, then you will get additional protection against hacks and online transactions. Scan the whole Mac or perform customize scan and eliminate the files which are a real threat to your macOS Mojave. The Sophos Home is build up to bring ease significantly in managing more than one Mac’s using the single account. Yes, you can manage up to 10 Mac’s with the one account. But you can only do using web interface. The antivirus works in the background and protects Mac from malicious content, and even it prevents danger from the browser. Besides, you will also get parental control facility with Sophos Home. There are a lot more features are still not introduced in this paragraph but when you download this best free antivirus for macOS Mojave then with its straightforward interface you will get to know about its more functions.